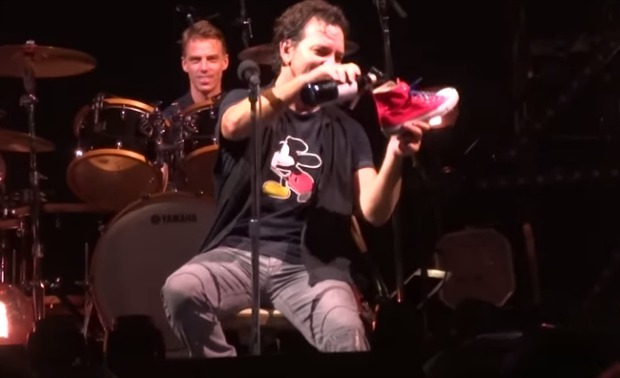 At a recent Pearl Jam show in Stockholm, Sweden, this past weekend, frontman Eddie Vedder found himself with a bottle of red wine onstage but no glass to drink it out of. One fan decided to save the day and throw their red Converse sneaker on the stage. “I'm gonna do you one better,” the “Alive” singer says, before pouring the wine into the shoe and chugging it. Drummer Matt Cameron, laughing, shakes his head in disgust. Check out video of the stunt below, and let us know your thoughts.